Detailed on a Kickstarter project page, the Vamp is a bridge device between older speaker technology and mobile, Bluetooth-enabled devices like smartphones and tablets. Molded within a case that’s similar in shape to a Boxee Box, The Vamp device includes a single channel amplifier with a four-watt peak and a rechargeable battery that has a minimum of ten hour battery life. 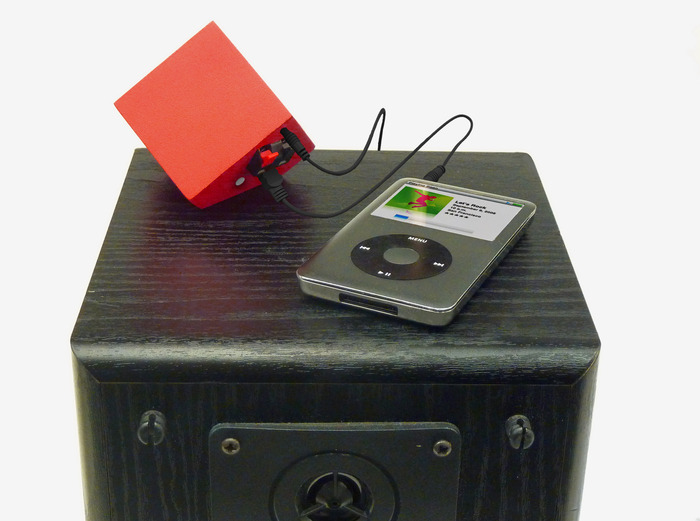 Basically, the user can connect The Vamp to a older speaker using the traditional red and black speaker connectors and connect their mobile device to The Vamp over Bluetooth to start playing music immediately. On the back of The Vamp, the user will find the mini-USB charge socket, a mini-stereo jack for a headphone-style plug, the power switch as well as the red and black speaker connectors for speaker wire. The Vamp can simply sit on top of the speaker or it can be mounted on the side of the speaker magnetically using an included disc and an adhesive foam pad. The mounting plate can be particularly useful when attaching The Vamp to a large, floorstanding speaker when there’s a limited amount of speaker wire available. The Vamp is also compatible with older portable music players without Bluetooth, such as the original iPod, when using the provided line-in cable. The team building The Vamp tested the device on a variety of speakers and were able to produce a maximum of 95 decibels. While volume is important, the creators claim that the overall sound quality is significantly better than the majority of Bluetooth speakers on the market. 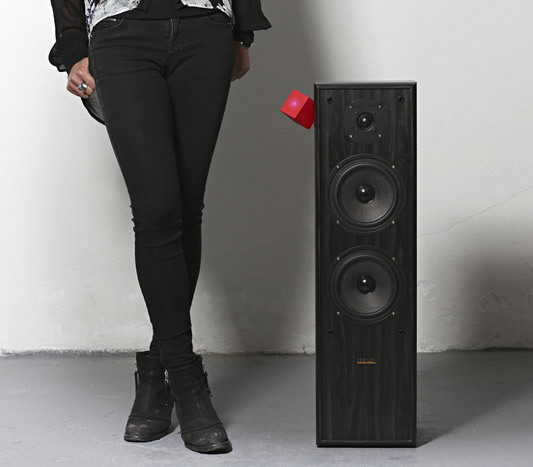 Assuming you already have a speaker ready to go, the Vamp is also much cheaper than a Bluetooth speaker alternative. While The Vamp is priced at £35 (approximately $53), a Jambone BIG JAMBOX, for instance, has a MSRP of $299.99. However, one downside to The Vamp is that is does not play stereo sound. 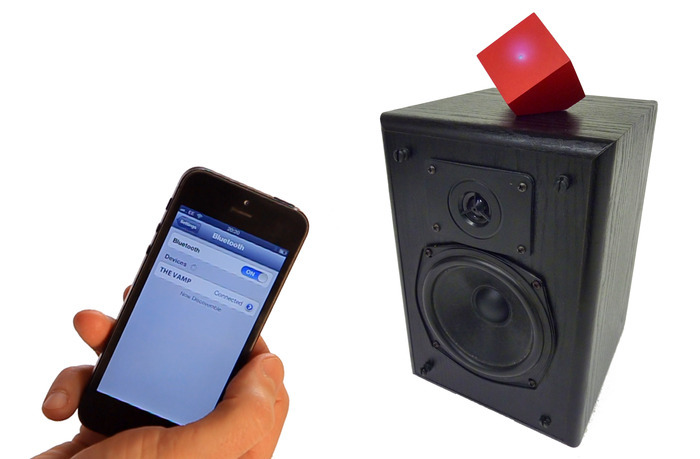 The device combines the left and right channels and plays them through a single speaker. According to the details of the project, Paul Cocksedge and his team need additional funding in order to invest in injection molding tools, patent costs and overseeing development in Asia as The Vamps roll off the production line. While the basic model starts at £35, the Kickstarter page includes options for customizing The Vamp with an engraving as well as a signature from the creator. Since the design phase is finished, the first batch of The Vamp devices are expected to roll out to Kickstarter backers by June 2013. As with any Kickstarter project, the shipping window could be delayed due to manufacturing issues or other problems.